Levanto is a famous seaside resort along the Italian Riviera, 80 km east of Genoa. This a perfect starting-point for visiting the picturesque villages of Cinque Terre. From Levanto you can easily reach the five villages by train (5 minutes), by boat or by foot through guided tracks. 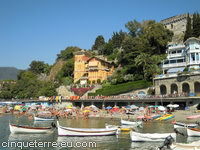 Levanto is a small beautiful town with a long sandy beach, shops and restaurants. This popular sea resort is surrounded by a green valley of pine forests, olive groves, vineyards and small medieval villages. 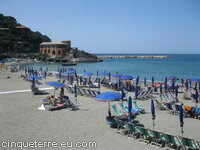 Levanto is not only a place for sun-bathers, divers, surfers and hikers. It’s also an ideal starting-point for day-trips by train or boat to many interesting places along the Riviera such as: Portovenere, Lerici, Tellaro and Fiascherino in direction La Spezia, and Portofino, Santa Margherita, Camogli and Sestri Levante in direction Genoa. It's easy to find a nice hotel in Levanto! There is a wide range of four- and three-star hotels with good standard or if you prefer some very romantic Bed & Breakfasts near the beach. The shops are generally open from 9 a.m. to 1 p.m. and from 4:30 p.m. to 7:30 p.m. From Monday to Saturday there is a covered market selling fruit, vegetables and fish. Every Wednesday a nice open air market (clothes and shoes). We can recommend the shops selling Pasta Fresca; all sorts of fresh pasta (ravioli, gnocchi, trofie etc) and different sorts of vegetable- rice- and zucchinipies, lasagne and pesto. A network of walking paths connects Levanto with the National Park of Cinque Terre (Levanto - Monterosso 3 hours by foot). We also recommend to visit the beautiful village of Bonassola situated just a few kilometers west of Levanto with a wonderful beach. 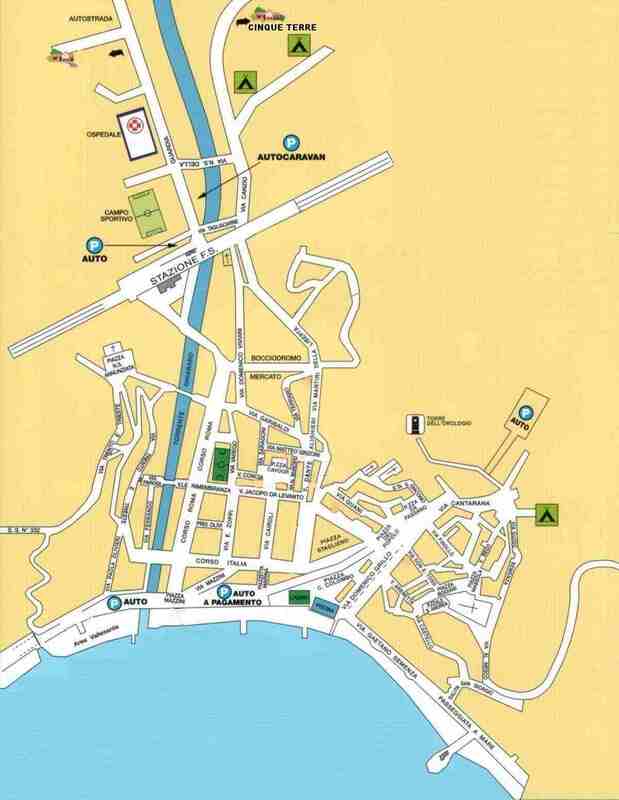 You can find other maps at our page Cinque Terre Maps. 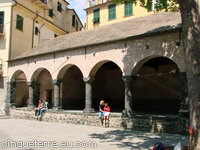 - The "Castello Medioevale" and the "torre dell'orologio"
Here on Levanto footpaths map a list of the footpaths with related pdf map. Two main parking areas are located near the railway station and the waterfront. Please refer to the Parking in Levanto section. - 3rd Sunday of May, Mangialonga, wine & food walk through the trails of Levanto valley. - 3rd Sunday of July, Festa di San Giacomo (festa del mare) (Festival of the sea). Feast of Levanto's patron Saint James with religion procession, flag-throwing and fireworks. - July and August: Festival Amfiteatrof - international festival of classic music. - August, 10: Tuffo sotto le stelle – beach party. - August: La Traversata del Golfo di Levanto - Swimming race. Everyone can join, distance 1 mile. A consolidated town's tradition. - October: De Gustibus Tour - an enogastronomic walk through the historic center of Levanto, tasting of local specialties offered by the commercial shops. Torta d'erbe, ravioli al ragù and more. - October: La Stralevanto, half marathon (circa 14,5 Km) in Levanto and sorrounding area.